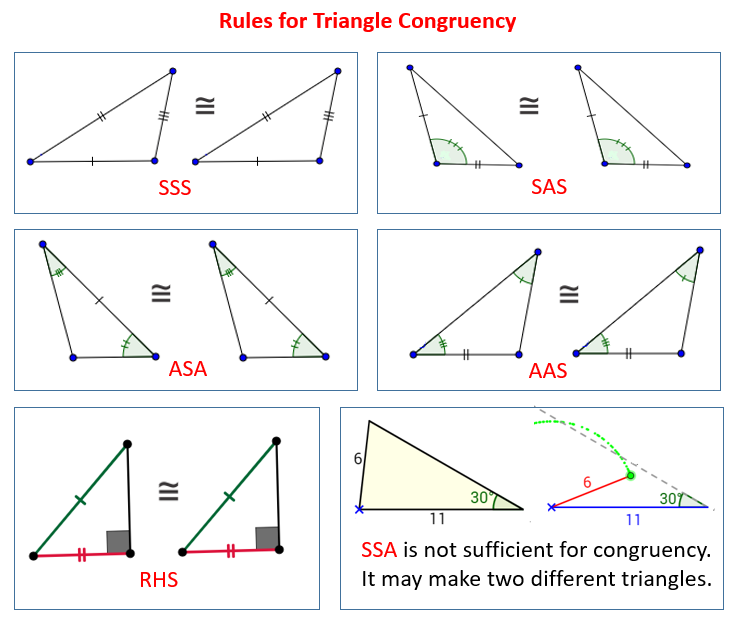 The following diagrams show the congruent triangles shortcuts: SSS, SAS, ASA, AAS and RHS. Take note that SSA is not sufficient for Triangle Congruency. Scroll down the page for more examples, solutions, and proofs. How to use the SAS and SSS shortcuts to determine the congruence of two triangles? If two triangles are congruent, all three corresponding sides are congruent and all three corresponding angles are congruent. If two pairs of corresponding angles and the side between them are known to be congruent, the triangles are congruent. This shortcut is known as angle-side-angle (ASA). Another shortcut is angle-angle-side (AAS), where two pairs of angles and the non-included side are known to be congruent. ASA and AAS are important when solving proofs. In right triangles, if two legs are congruent and if the two hypotenuses are congruent, then the triangles are congruent. This is known as the hypotenuse leg theorem. Note that this is the SSA shortcut which does not apply to non-right triangles. Applying the Pythagorean Theorem shows that only one value is possible for the other leg. Therefore, the two triangles are also congruent by the SAS or SSS congruence shortcut. Four shortcuts allow students to know two triangles must be congruent: SSS, SAS, ASA, and AAS. Knowing only side-side-angle (SSA) does not work because the unknown side could be located in two different places. Knowing only angle-angle-angle (AAA) does not work because it can produce similar but not congruent triangles.